Our Carboxyl Terminal Peptide (CTP) technology is used to extend the half-lives of pharmacoactive proteins. CTP uses eDNA technology to fuse a short, naturally occurring amino acid sequence (a carboxyl-terminal peptide) to a target protein. This modification results in slower excretion of the therapeutic protein to which it is attached, thus, extending the protein's half-life. At OPKO, we currently use CTP technology in our hGH products for human growth hormone deficiency and Factor VIIa product for hemophilia A & B, which provides reassurance that CTP can be used safely and that it is effective in extending the serum lifetime and activity of other targets, including short acting molecules used to treat endocrinological disorders. Our Reversible PEGylation technology is a novel technique for creating extended release therapeutics. In Reversible PEGylation, a conjugate is formed through a proprietary bi-functional hydrolyzable linker, between a drug that contains a primary amine group and a polyethylene glycol (PEG) chain. Once the conjugate enters the bloodstream the linker hydrolyzes in a controlled manner and the intact drug is gradually released. Depending on the peptide or protein, the release molecule can either work locally, systemically or cross the blood brain barrier at receptor sites. In our anti-Natural Antisense Transcripts (AntagoNAT) technology, an oligonucleotide molecule is designed to interfere with regulatory gene expression in order to enhance production of endogenous functional proteins. This strategy is unique and contrasts with established approaches which down-regulate protein production. This platform can lead to the discovery of new drugs to target relevant genes that regulate the optimal production of endogenous functional proteins. One of the leading applications of our AntagoNAT technology is OPK88001 which is designed for the treatment of Dravet syndrome by targeting the mutated of SCN1A gene. The Claros® 1 device is a point-of-care, bench top diagnostic instrument system designed to provide rapid, qualitative blood test results in 10 minutes, right in the physician's office, using cutting-edge microfluidics in a credit card sized disposable test cassette. 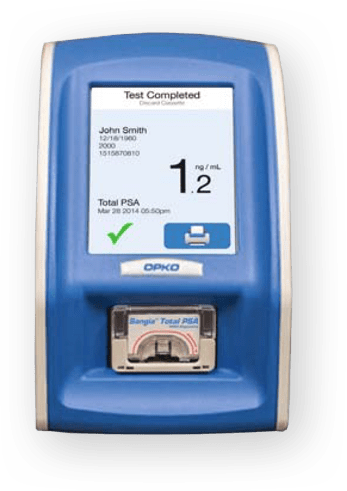 The Claros® 1 prostate-specific antigen (PSA) test, which provides measurements comparable to large instruments used in central reference laboratories, received FDA approval in January 2019. Additional test menu options for this platform are planned for future regulatory approval.